Religious discrimination in the workplace means treating a job applicant or an employee unfavorably because of their religious beliefs. It can also mean treating someone differently because of their association with an individual who practices a particular religion. Religious discrimination is a serious offense. Federal, New York state, and New York City laws protect employees from religious discrimination, including workplace harassment because of religion. If you experience religious discrimination at work, a New York religious discrimination lawyer can help. It is illegal for an employer to make employment decisions based on your religion. Employers cannot make employment decisions based on your religion––or lack of religion––instead of your skills or how well you do your job. This includes decisions about hiring, firing, discipline, distribution of benefits, promotion, compensation, job training, or any other condition of employment. New Yorkers are protected from religious discrimination by employers under Title VII of the Civil Rights Act of 1964 (Title VII), the New York State Human Rights Law (NYSHRL), and the New York City Human Rights Law (CHRL). The law doesn’t just apply to organized religions. Religious discrimination laws protect members of traditional, organized religions like Christianity, Judaism, Islam, Buddhism, and Hinduism. It also protects people who have sincerely held religious, ethical, or moral beliefs, as well as those who profess no religious beliefs. Making employment decisions––including hiring and firing––based on religious beliefs or practices violates the law. However, religious organizations are generally exempt from this provision. You apply for a job for which you have experience and excellent qualifications. However, the hiring manager says the company can’t hire you because some of the company’s long-time clients are not comfortable dealing with a Muslim in that position. You are told that you are being laid off due to company cutbacks and reorganization, but the only employees let go are you and another employee who recently converted to Judaism. All the other non-Jewish employees keep their jobs. You have a record of positive evaluations at your job, but when you tell your employer that you have recently joined an evangelical Christian church, you are fired. Laws against religious discrimination also protect employees from not receiving promotions, including tenure, because of their religion or affiliation with someone of a particular religion. You have worked for your company for several years, receiving exemplary reviews and an employee-of-the-year award, but when you apply for a promotion, your Christian supervisor denies your promotion because he wants to promote a fellow Christian employee instead of a non-Christian. You are a teacher on a three-year tenure track at a public school. You have always received excellent performance evaluations. However, as your tenure review draws near, your boss questions whether you are a good fit for the school because you are an atheist. You are denied tenure. Employers must provide reasonable accommodations for an employee’s religion or religious practices. The law requires employers to reasonably accommodate the religious beliefs or practices of employees, unless this would cause more than a minimal burden on the business. This includes accommodations for dress and grooming practices. The employer maintains a dress and grooming code which states that employees must leave their heads uncovered. A Muslim employee requests an exception to wear her headscarf. A Christian employee who is not affiliated with one particular denomination requests Sundays off to accommodate his religious beliefs that prohibit working on his Sabbath day. A private company opens its weekly staff meetings with a group prayer. An employee who is an atheist asks to be excused from the religious portion of the meeting. However, employers do not have to provide accommodations that would cause undue hardship. For example, accommodations that are costly, would compromise workplace safety, or would decrease workplace efficiency may not be covered by religious discrimination laws. Similarly, accommodations cannot infringe on the rights of other employees. Employers cannot treat employees differently based on religion. 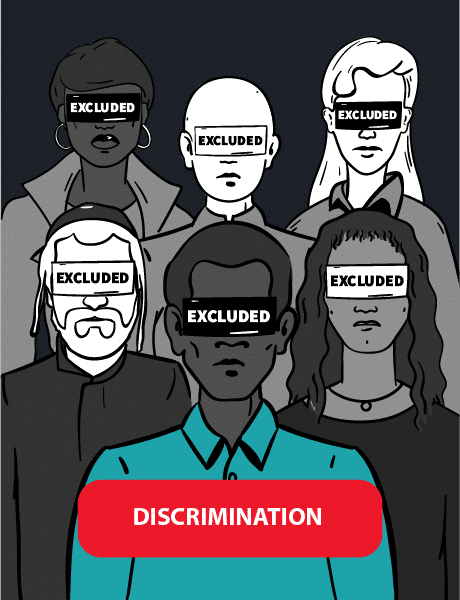 Disparate treatment of employees is illegal both when motivated by bias or preference based on religious beliefs and practices. This includes disparate treatment of workplace religious expression. When evaluating two equally qualified candidates for a job, the hiring manager decides to choose the Christian applicant instead of the Buddhist applicant, because a Christian will “fit in better” at the workplace. An employer decides not to hire a Muslim job applicant because he is concerned that she will request a reasonable accommodation to the dress code in order to wear a headscarf at work. Several employees are allowed to display a Bible on their desks at work, while a different employee is told that he should keep his Quran in a drawer because the employer doesn’t want customers to be offended. An employer requests that their employment agency screens out applicants who have a name that is frequently associated with a particular religion, such as Mohammed. Unintentional religious discrimination can also be illegal. Job policies that appear neutral can be discriminatory if they disproportionately harm workers of one particular religion in cases where the policy is not job related. For example, an apparently neutral policy that requires all male employees to have a clean shaven face with no exceptions would violate the rights of Sikh employees whose religious practice includes not cutting their facial hair. Similarly, requiring a certain hairstyle could violate the rights of a Rastafarian who has dreadlocks. You can be the victim of religious discrimination even when no employment decision is involved if religious-based harassment has created a hostile work environment. A hostile work environment can be created by jokes, slurs, or offensive or derogatory remarks about a particular religion or a certain religious practice. New York City has a generous standard for a hostile work environment, which is defined as being treated less well than others because of your religion as long as the poor treatment amounts to more than a “petty slight” or “trivial inconvenience.” Federal and state law require that the conduct be either severe or pervasive. It is a misconception that only the target of hostile comments can be the victim of a hostile work environment. You can be a victim even if you are not the person being targeted by the offensive behavior––and even if you are not a member of the targeted religion. It is a misconception that only your boss can create a hostile work environment. Employers have a responsibility to prevent religious discrimination. A co-worker, a supervisor in another area of the company, or even a non-employee, like a vendor, can be the perpetrator. There are exceptions to religious discrimination protections. Religious organizations and religious educational institutions are exempt from certain religious discrimination provisions. In addition to this exception, employees who serve in clergy and related roles are barred from claiming religious discrimination under what is known as the ministerial exception. The law defines religious organizations as institutions whose “purpose and character are primarily religious.” These organizations are allowed to give employment preference to members of their religion. The exception does not apply to other forms of discrimination––a religious organization cannot, for example, claim that it cannot hire African Americans, gay or transgendered people, or women due to its religious beliefs. The ministerial exception is based on the First Amendment principle that the government should not regulate churches, which includes the appointment of clergy. On this basis, religious organizations can refuse to hire women in ministerial positions. Discrimination can happen in any workplace. If you think you are the victim of discrimination or a hostile work environment, there are several steps you can take right away. It is important to make it clear that the behavior is unwelcome and keep records to prove that you did. If you complain about religious discrimination, it is illegal for your employer to take any action against you. If you choose to file a claim for religious discrimination, you have several options. You can file a complaint with the U.S. Equal Employment Opportunity Commission (EEOC), which handles violations of federal law. The New York State Division of Human Rights handles NYSHRL violations, and the New York City Commission on Human Rights is responsible for CHRL violations. If you have been the victim of religious discrimination, your employer may owe you back pay, damages, and other financial relief. A New York religious discrimination lawyer can help you file a claim. Back Pay: Back pay is the money you would have earned if the religious discrimination had not taken place. It can include wages, bonuses, stock options, benefits, retirement contributions, and more. Reinstatement: In cases of wrongful termination, the courts can order your employer to rehire you. Similarly, if you were wrongly denied a promotion, you can receive it. Front Pay: Front pay compensates victims of discrimination for future earnings lost because of discrimination. Courts determine the amount needed to return to the same pay level prior to the discrimination. Compensatory Damages: Compensatory damages covers out-of-pocket costs like therapy, lost wages, or a job search. It can also include pain and suffering. Punitive Damages: Punitive damages punish the employer for not preventing the discrimination. New York City law provides punitive damages in cases where employers show negligence, recklessness, or a conscious disregard of employee rights. Attorneys’ Fees and Costs: If you win, the court can order your employer to pay your attorney for his or her work on your case. This includes expert witness fees and court costs.